Welcome to where friends and family gather to have a good time and good memories.You'll enjoy the atmosphere here. Artifacts from the golden era of aircraft brings a unique romantisism to 'The Hanger'. We provide full service, off premise catering, for your individual needs.  At Angelinas, we serve spaghetti you can't get anywhere else. Our gravy comes from an authentic family recipe which has been in our family for generations. We have a full service restaurant, a lounge - "The Hanger", a deli, and offer take-out orders and reservations for parties of 6 or more.